In the years which followed a lot has changed. Stansted is now a major hub for low cost airlines and annual passenger figures have risen to more than 23 million. The terminal has been extended twice, including a £50m extension to the arrivals area that opened in 2008, and improvements costing more than £80 million in the past three years. Click below to watch ITV Anglia's coverage from 1991 of the opening of the new terminal complex at Stansted Airport. The presenter is Timothy Evans. 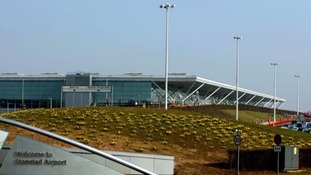 The airport's original owners, the British Airports Authority, failed in their plans to build new runways at Stansted and subsequently sold the airport to the current owners, Manchester Airports Group. More than 12,000 people rely on the airport for employment and it's a major driver in the regional economy. Stansted is now in the top 25 busiest European airports and is the busiest single terminal airport anywhere in the UK. Click below to watch a promotional film produced in the1980s by the British Airports Authority making the case for Stansted expansion. When the terminal opened in 1991 Stansted flew to 50 different destinations. Today that number has grown to 170. More than 1.69 million passengers passed through the airport in February 2016 up 15% on the same month the previous year. It proved to be the busiest ever February the airport has ever had. With the debate over airport expansion in the UK still unresolved Stansted is set to continue to be a major player in the years to come. You can watch Matthew Hudson's piece on 25 years of Stansted Airport below. For many people the airport has meant jobs for life, and for some much more. Security officers Darren and Claire Johnson found love at Stansted. You can watch their story here. Well Aidan's been finding out more about forecasting the weather at the airport and you can watch his piece here.